Overview of our Top 5 Best Hybrid Bikes. Hybrid Bike Buyer’s Guide. If you are looking to combine the benefits of a road bike with a mountain bike this year then you have come to the right spot. On this page you will see what we feel are the best hybrid bikes available in 2015. We have done our best to include reviews for both men’s & women’s specific models and have tried to keep the cost of each bike under $500. In fact the last time I checked, most of the bikes below are less than $300. There are so many hybrid bicycles in the market now that narrowing our list down to 5 was not an easy task. We tried to balance all kinds of factors in the table below including cost, how well others rated to product, a breakdown of all features, and much more. Sizes 17" 15", 17", 19", and 21" 18" 15", and 17"
As I mentioned earlier, coming up with a list of 5 top hybrid’s was not easy. In this section I explain why we like the five we chose and provide a quick review of each. 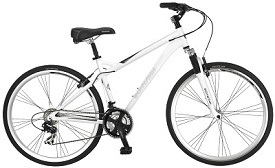 Diamondback Edgewood: The Diamondback Edgewood has secured the number 1 position in Amazon’s top rated hybrid bikes and it is users’ most favorite bike that offers all the best features anyone would want in a casual bike at this price. But users don’t love it for nothing. Featuring a butted aluminum sport hybrid geometry frame, the bike is tough and strong yet very lightweight, which spells only one thing: smooth and fast riding, meaning it will just glide on paved roads. The 700c smooth rolling tires make this bike as efficient and fast as a road bike while the upright frame, comfy cockpit, DB Deluxe double density saddle and great grips make this bike as comfortable as a comfort bike. Complete with Shimano 7 speed drivetrain and Easy Fire Trigger shifters, this bike offers a nice range of gear ratios that will allow you to go smoothly up hills and speed on flat land. The Sport Comfort 63mm suspension fork plus the suspension seat post further round up this bike offering you a highly stable and comfortable ride while absorbing the impact from bumps and obstacles along the way. Flawless linear pull brakes provide increased control and enhanced safety. All these features make the Diamondback Edgewood a highly recommended purchase for all casual riders who plan to ride around their neighborhoods and for short commutes around town. Read our full review. 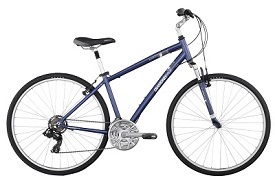 Schwinn Network: The Schwinn Men’s Network is one of the best hybrid bikes for men available at this price range. Although priced in the low end range, it includes many features that give a performance close to a high end bike. The Schwinn Men’s Network is especially loved by users because of the comfortable ride it provides. The geometry frame is designed to give you the perfect upright position while the padded seat post and the sweptback handlebars make sure you don’t feel any strain in your body while riding it. As far as performance is concerned, the Schwinn Men’s Network scores well. It boasts a pure aluminum hybrid frame that is super light to handle as well as high quality and lightweight alloy rims for increased durability and improved handing. When all this is coupled with high end features like Schwinn suspension fork and 21 speed Shimano rear derailleur and Easy Fire Trigger shifters, it results in a bike that rolls smoothly and efficiently no matter which path you choose. Suspension seat post further absorbs shocks and vibrations and gives you a smooth ride. The Schwinn Men’s Network is a highly recommended machine overall for all casual riders who plan to commute around town, maintain their fitness level, or just go for a leisurely ride. Read our full review. 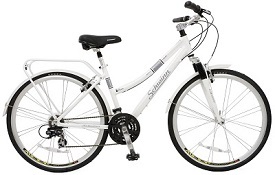 Schwinn Discover: Featuring a comfortable and lightweight aluminum hybrid frame, the Schwinn Discover hybrid bicycle for women is truly the best money can buy especially for this price. It sports 700c smooth tires surrounded by top of the line rubbers that will allow you to go as far as you want without any hassle of replacement and will roll over smoothly over even roads. Plus, the Suntour suspension fork on this bike provides greater stability and control, making it suitable for beginners and riders who want to ride on rough terrains. While the smoother tires will hold onto paved trails, the suspension fork will make sure you stay stable over obstacles, dirt and gravel roads. To prioritize your safety and to give you more control, the bike uses alloy linear pull brakes, which make sure you never find yourself against anything when riding. Not only that, but the 21-speed Shimano drivetrain and shifters provide an amazing gearing range that is just too generous especially for a hybrid bike at this price. This gearing range allows you to climb hills, ride on rough terrain or even win medals in road racing. 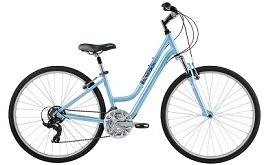 All in all, the Schwinn Discover hybrid women’s bicycle is a lot more worth for than it costs. If you want a bicycle for short commutes around town or for leisure riding on even roads, this one is highly recommended. Read our full review. Diamondback Vital 2: Elegantly built with a geometry frame that is specifically designed for women’s smaller bodies and comfort levels, the Diamondback Vital 2 is the top choice for all women riders who want a stylish bike that combines the relaxed contact point features of a hybrid comfort bike with the 700c smooth rolling efficiency of a road bike. The butted aluminum frame is although tough and strong, but still lightweight to give you increased efficiency and improved handing. Combined with the ultra-comfortable double density saddle and upright handlebars, the bike makes sure your comfort is not compromised. As far as smoothness is concerned, the Vital 2 makes sure you just glide as you ride even on rough terrains like dirt and gravel roads. The 63 mm front suspension shock as well as suspension seat post absorb all vibrations from obstacles along the way, smoothing out the ride. To give you immaculate performance, the bike boasts a Shimano 7 speed drivetrain with Shimano Easy Fire trigger shifters that not only make sure you go on smoothly and efficiently on any path you choose whether steep hills or flat lands, but also make it super easy to change gears. All these features combine to make the Diamondback Vital 2 the best purchase for any woman rider who wants to experience the joy of riding while still keeping her comfort in check. Read our full review. Critical Cycles 7-Speed: Elegantly built with a mid-century vintage style, the Critical Cycles Dutch Style 7 speed hybrid bike is a must have for all women who want an affordable bike to commute around town, run errands, and maintain their fitness level. This bike is especially built considering the comfort level of a woman. 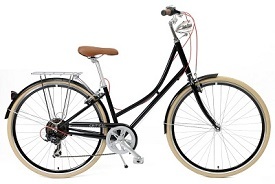 The looped and curved step-through frame is a classic and proven design that lets women ride even with their skirts on. It makes getting on and off the bike easy. Whether you are riding to the grocery or commuting to work in a suit, this bike will take you without any problem. The tig-welded steel geometry frame is designed to give you a comfortable upright riding position while upright handlebars let you ride with your eyes straight ahead on the road, giving you utmost comfort even on longer distances. When this is combined with the Shimano 7 speed drivetrain, it results in a high performance bike that will let you choose any route you want. Whether you want to climb up hills or go fast on flats, this bike will be capable of anything. Plus, with the elegance and vintage look, this machine is sure to get lots of compliments from others. It is surely the best option for a hybrid bike available at this price range. Read our full review. Hybrid bikes combine the power and speed of road bikes with the comfort of a mountain bike. These feature lightweight rims and taller gearing that allow you to go faster like a road bike while stouter frames that can carry more weight like of cargo and better shock absorption that can withstand potholes during a regular commute. Hybrid bikes also feature slightly wider tires that give better traction and stability than road bikes. 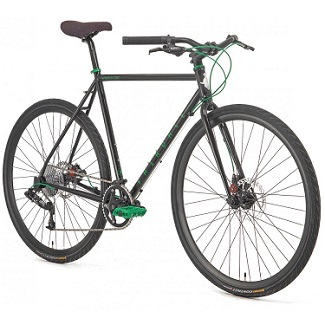 In short, it offers the best of both road and mountain bikes and are a great choice for commuters who want to enjoy a fun ride on both paved and unpaved roads. However, a lot of features need to be considered when buying a hybrid bike to make sure you get the right fit. Here is what you need to know. Hybrid bikes come in two variations: comfort and hybrid. Comfort bikes are slower and have a vintage appeal to them. They have step-through features, suspension systems, and comfortable saddles, which are good for people who are less flexible and are more comfortable with their feet close to the ground. On the other hand, hybrids are much faster and are good for people who want to travel long distances, work out a bit more, and climb hills. Comfort bikes usually have 26 inch tires that are mostly found on mountain bikes. 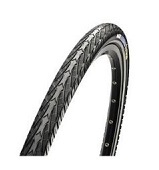 These wider tires provide a cushion of air for easy rolling over bumps and obstacles. 29er bikes feature 29 inch knobbly tires like that on a mountain bike. Hybrid bikes usually feature the 700c tires of road bikes, which allow for faster acceleration on paved roads and for climbing. The 700c tires are available in different widths and treads that allow for easy rolling on all surfaces. Hybrid bikes are usually available in a variety of frame materials, the most common being aluminum and carbon. Aluminum is lightweight, strong, rust and corrosion resistant, and provides a great ride while also being affordable. However, it is heavier than carbon. Carbon is absolutely the top choice, is the lightest material and provides a smooth ride. However, it is the most expensive. Suspension forks found on bikes absorb the impact of shocks from potholes and other obstacles on the way, ensuring that you enjoy a smooth ride and remain in control even on rough terrain. Look for a suspension seat post as well as it will absorb vibrations on rough terrain and pothole-covered roads. The gearing you choose depends on where you plan to ride. If you plan to ride on hilly terrain, get multiple gears. But if you plan to ride on a flat area, fewer gears or even a single speed will be good enough. Seats come in anatomical shapes, cutouts, flexible frames, and cushioning springs. The best way to see if the seat is the right one for you is to sit on it and test. Don’t forget about the extras that will make your ride more fun and comfortable. Ask the salesman to recommend the best accessories that you need, based on where you plan to ride and your purpose of riding. Well there you have it. I hope that you have enjoyed our page dedicated to the best hybrid bikes available. We hope that each of our reviews will help you find the perfect bike for your next adventure. Happy riding! Best Bicycle Reviews for 2019 Copyright © 2019.